Regular upgrades to the Russian capital’s public transport network seem to have little effect on the burgeoning traffic jams. Moscow’s legendary traffic problem is continuing to defy attempts to keep it under control as car ownership keeps growing and motorists refuse to give up their cars in favor of public transport. The Russian capital's efforts to reduce traffic jams by building new roads and developing the city’s public transport network have failed to deliver the results the city authorities were hoping for. The problem began after the breakup of the Soviet Union in 1991, when people in Russia began to buy cars en masse. Over the years the explosion in car ownership had an increasingly negative effect on traffic in large cities around the country, though predictably traffic jams remain worst in Moscow. Between 1992 and 2010, the guiding principle for the Moscow city authorities' approach to traffic congestion was: There are too many cars, so we need to expand the road network, explains Konstantin Trofimenko, head of the transport studies center of the Higher School of Economics. In the 1990s, the Moscow Ring Road (MKAD), which encircles the whole city, was revamped and the Third Transport Ring (TTK) was built. However, the number of cars on the roads continued to outstrip the rate at which new roads were built. Moscow's huge traffic problems became one of the reasons why the city's former mayor Yury Luzhkov had to resign. Moscow's layout (a combination of radial and circular road patterns with a small set of bypasses) makes it a city better suited for public transport, Trofimenko explains. Mayor Sergei Sobyanin, who replaced Luzhkov in the mayor’s job in 2010, has made the development of public transport his priority. Dedicated lanes have been established on many streets. Parking in the center of the city is no longer free and the anti-congestion zone keeps expanding. New subway stations are being built, and new carriages for the underground network are being bought, together with trams, trolleybuses and buses. A new single fare system for the whole public transport network has been introduced. In addition, the new city government is trying to improve the interconnectivity of Moscow roads without substantially expanding them: New overpasses are being built, and bridges and highway interchanges are being repaired and upgraded. There is now non-stop traffic on key motorways in the city. On the outskirts, some 180 park-and-ride facilities are being built for drivers who live outside the city to leave their cars on a free parking lot and take public transport into the city center. In the historical center, many streets are being converted into pedestrian-only areas. Overall, between 2012 and 2020, the city government plans to spend 4.4 trillion rubles ($117.8 billion) on developing Moscow's transport system. Yet, as of late 2013, Sergei Sobyanin is yet to deliver a significant improvement to the city's traffic problems. According to the Yandex.Probki online service, which measures traffic congestion, between spring 2011 and spring 2013, the speed of traffic on Moscow’s roads actually decreased. Moscow officials contested these findings. According to the city’s traffic management center, in 2013 the average speed on eight of Moscow's 10 outbound routes either increased or fell insignificantly by 1-3 kilometers per hour (0.62-1.9 mph). Only on two routes - Leningradskoye Shosse and Kutuzovsky Prospekt – did speed drop considerably, by 8-6 kph (5-3.7 mph). Experts and city authorities are convinced that the problem of traffic congestion can be resolved only by motorists themselves, but they need to give up their cars and make the switch to public transport. "Moscow roads are fit to cope with only 20-30 percent of the city population driving daily, while the remaining 70 percent should use public transport. Otherwise the city will just stand still," says Konstantin Trofimenko. However, efforts by city authorities to improve conditions for public transport passengers and pedestrians are typically rejected by the majority of motorists. In Soviet times, only the chosen few could afford a car, so for many Russians having a car of one's own is still seen as a status symbol and a sign of success in life. One of the main causes of traffic jams in Moscow is the fact that roads make up a relatively small proportion of the total space of the city. While in the center of Moscow, roads make up 24 percent of the total area, on the outskirts, that figure drops to 10 percent, explains Mikhail Blinkin, head of research at the Transport Studies Institute. In cities like New York, Los Angeles and Sydney, street and road networks account for up to 35 percent of the total urban area. In Europe, the figure is 20-25 percent, whereas in Asian metropolitan areas, like Singapore or Hong Kong, it is only 10-12 percent. The situation is further exacerbated by the number of cars: With 380 vehicles per 1,000 residents, Moscow is second only to New York. In other major cities, the figure is noticeably smaller: 280 in China, 320 in London. In the meantime, the number of cars in Moscow grows by 8-10 percent, i.e. 350,000-400,000, every year. 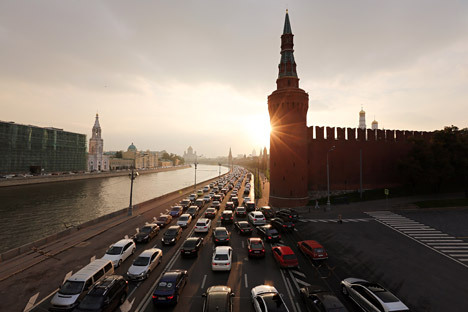 According to the Russian Traffic Police Directorate, as of 2014, there are 5.5 million vehicles registered in Moscow.